The middle class is barely treading water since the recent Great Recession, but the rich are back in a big way. And it's not just the 1%. It's the ultra rich -- the top 0.01% of earners -- that are really clobbering everyone else. In the mid-1980s the ultra rich -- those with a net worth of over $100 million -- owned just over 4% of the total wealth in the United States, according to a recent paper by University of California Berkeley economists Emmanuel Saez and Gabriel Zucman. 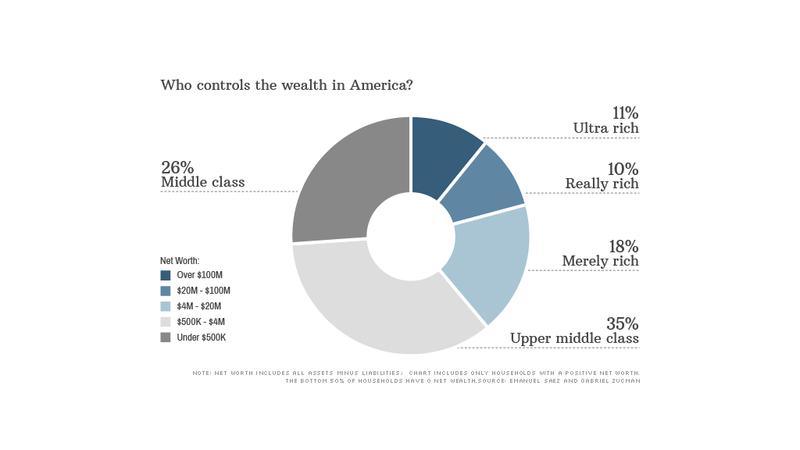 By 2012, their share of the wealth nearly tripled, jumping to roughly 11%. The really rich have done pretty well too. Those worth between $20 million and $100 million have seen their wealth share nearly double, while the merely rich -- those with wealth between $4 million and $20 million -- saw only a slight uptick. The other 99% of households saw a relative decline in wealth. "The higher you are in the income distribution, the greater the gains," said Branco Milanovic, a visiting professor at the City University of New York and an expert on income inequality. "People who are poorer haven't really benefited from the expansion." Why the variation in gains? Many Americans think it's because the wealthy enjoy low tax rates. But blaming tax cuts for this concentration is far too simple: Globally, the trend has been similar, and is expected to accelerate in the years to come. Indeed, the ultra rich around the world are expected to see their wealth grow by over 9% a year between 2012 and 2017, according to the Boston Consulting Group. There are over 3,000 of these $100 million-plus households in the United States alone. Meanwhile, households worth less than $100,000 are expected to see their net worth grow just 3.7% a year. No one knows why the rich are getting richer faster than everyone else, but there are plenty of theories. Some say it's because today's entrepreneurs tend to be quickly vaulted into the ultra rich category (think Facebook's Mark Zuckerberg), or that the already well-off have access to better financial products. Another theory is that the wealthy are better able to leverage technology and globalization to their advantage: As companies and markets become bigger, those at the top are given bigger rewards. "Talent is hard to find," said Robert Frank, Cornell University economist and author of The Winner-Take-All Society. "Production workers are not." French economist Thomas Piketty, in his new best-selling book Capital in the 21st Century, argues that inequality has always been extreme. The relative drop in inequality witnessed during the middle of last century was an anomaly, argues Piketty, caused not so much by the middle class becoming better off, but by the rich seeing their wealth destroyed by two world wars and the Great Depression. 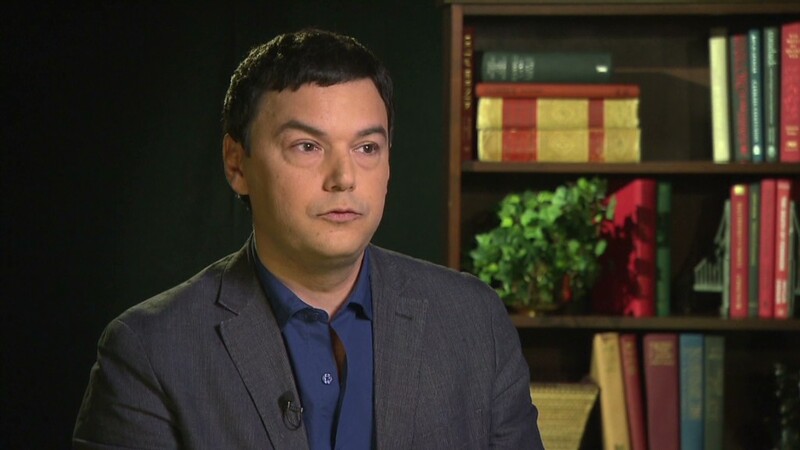 "We're going back to the kind of concentration of wealth we had in the 19th century," Piketty recently told CNN. Whether this widening gap between the rich and everyone else is a problem and what, if anything, should be done about it is up for debate. "I personally find it very worrisome," said Federal Reserve Chairwoman Janet Yellen during a recent Senate hearing. Inequality can "determine the ability of different groups to participate equally in democracy, and have grave effects on social stability over time." Some have made the connection between widening inequality and the rise of fringe political groups on both the right and left. Yet others downplay the growing wealth gap, and claim that current levels of inequality are overstated. Even if inequality is accelerating, they argue, so is overall global well-being. Billions have been lifted out of poverty worldwide over the last several decades, and in the developed world, the poor enjoy creature comforts unthinkable even 30 years ago. The critics are wary of policies, like Piketty's proposal for a global tax on wealth, that could hamper future growth. Whether the widening wealth gap is a serious problem, one thing is clear: The richest have a massive amount of money, and they're getting more of it every day.